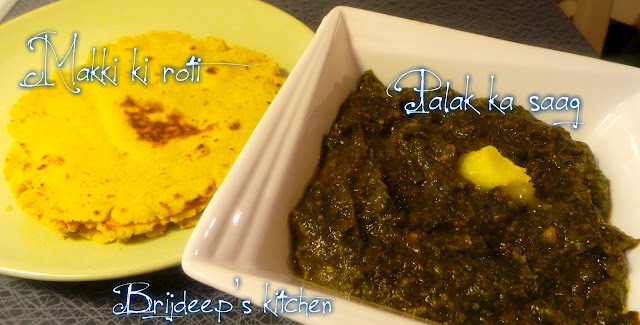 Well, this is the first food which comes in mind when we talk together of winters and Punjab! Oh yes, and as of almost all the Sikh households, this is the pride food of our home as well. 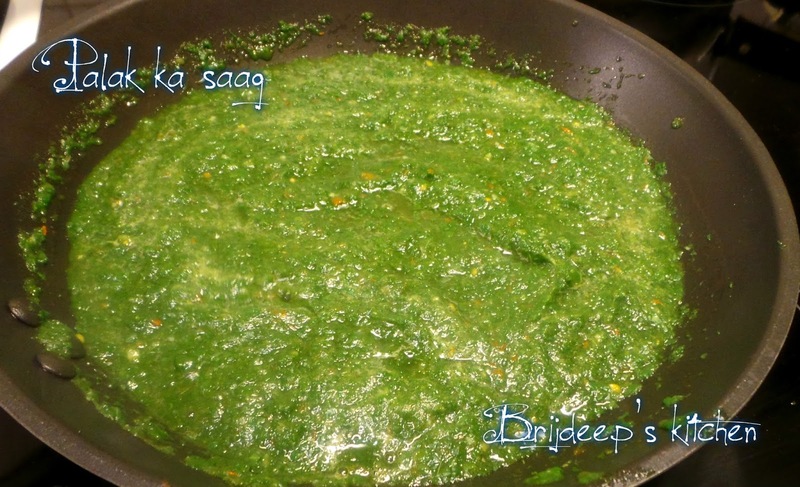 As the winters begin to set in in India, we see lush bright mustard greens in the vegetable markets and the preparations begin to prepare this awesome Sarson ka Saag which undoubtedly goes with flavorful makki ki roti. Unfortunately we don't get mustard leaves where we live so I prepared Palak ka saag instead. It tasted yummy and a wonderful alternative where mustard greens are not so easily available. In this post I'm sharing the recipe of both Palak ka saag (how I prepared it) and Sarson ka saag (recipe by my Nani ji) and also how to prepare the perfect Makki ki roti..
Wash and chop the spinach leaves. Assemble all the other chopped vegetables: onion, tomatoes, ginger, garlic and green chilli. 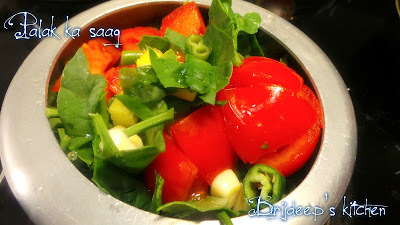 Add about 3 cups of water in a deep vessel or a pressure cooker and add all the chopped vegetables to it. Bring to a rolling boil in open flame. Turn off the flame and remove all the vegetables and let them cool. When cooled, grind them all to a smooth puree like mixture. Keep aside. Heat oil on medium flame and add the spinach paste to the pan. Stir well and let cook. Do not cover. Keep stirring and cooking. 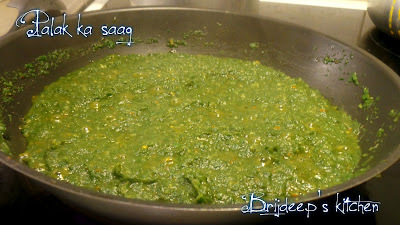 Add some water which was boiled with the veggies to the saag and keep stirring and cooking. Water is added because the saag will soon become dry in the process of cooking but will not be cooked properly. 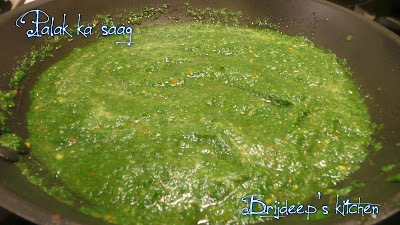 So adding water and stirring will give more time for saag to cook. This whole process will take about 15 minutes. Now add the makki flour to the saag. It will start getting thicker in consistency. Add the salt and the red chilli powder. 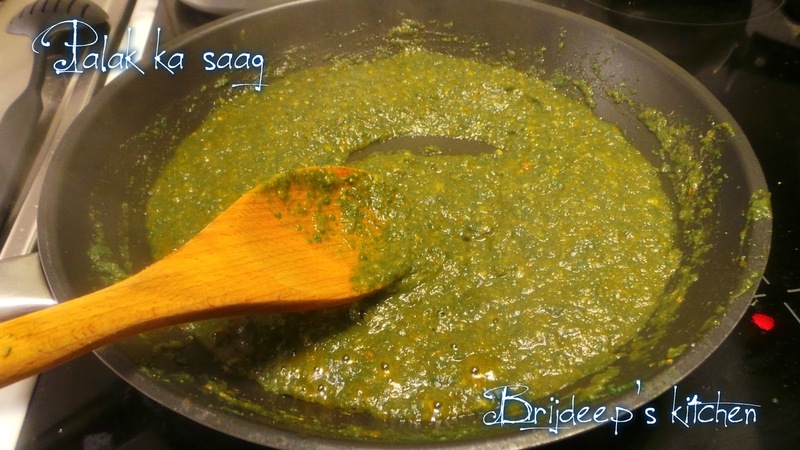 Keep stirring and after few minutes the water will evaporate and it will become the saag consistency. Turn off the flame. 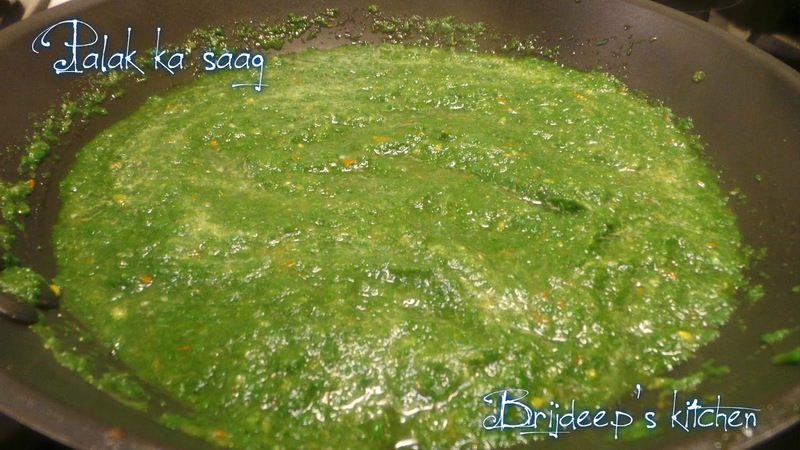 Now prepare the tempering for the saag: Heat the ghee on medium flame and crackle the cumin seeds. Add the onions and fry until they start getting brown. 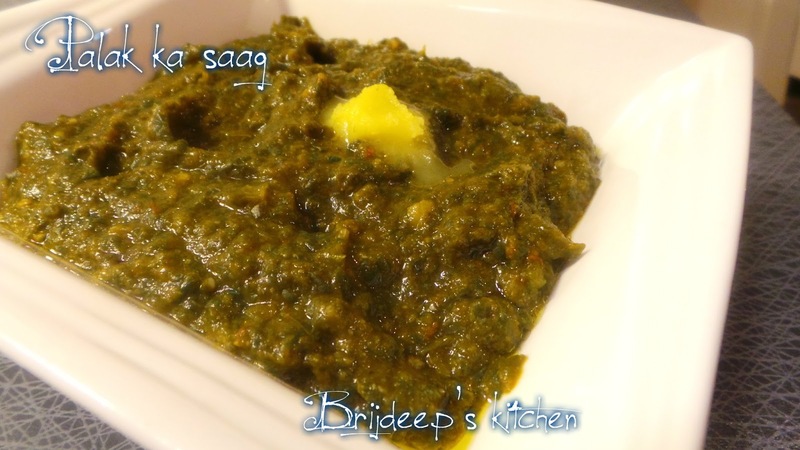 Turn off the flame and add the tadka to the saag. Mix well and cover. You can remove cover and serve after 10 minutes. 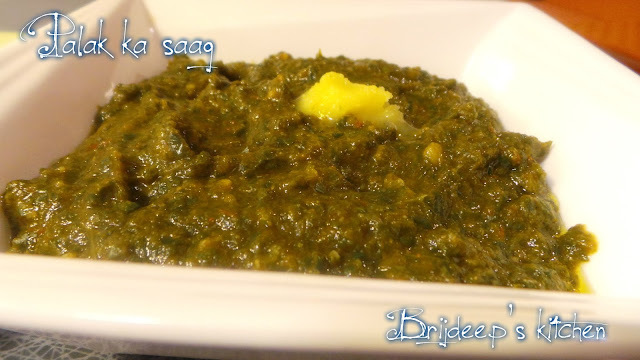 Saag is ready. Serve hot with a dollop of butter, makki ki roti, gud and achaar. 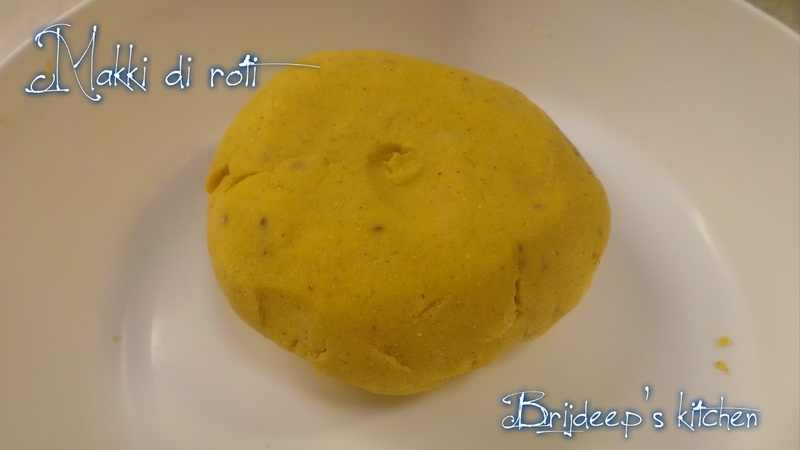 Take the makki flour in a kneading bowl and add in salt and carom seeds. Mix well. 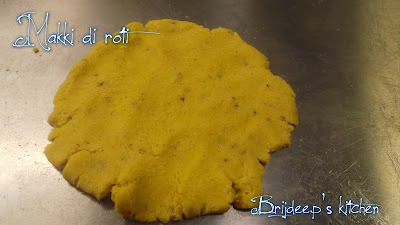 Begin by adding very little warm water to the flour and then mixing it with fingers. Keep adding little water and mixing the flour until it reaches a crumbling consistency. After that try and bind little flour together. Start keeping the little bits of binded flour to the side and again adding very little water and try to bind more bits of the flour. Continue keeping the binded flour to the side and try to make one big lump of the binded flour. Makki aata will not require a lot of water so be careful about adding water. Bind the whole flour into a big lump of dough and roll it between your palms to give it a round-like shape. the final product must not be sticky. Now will begin to make roti of this dough. 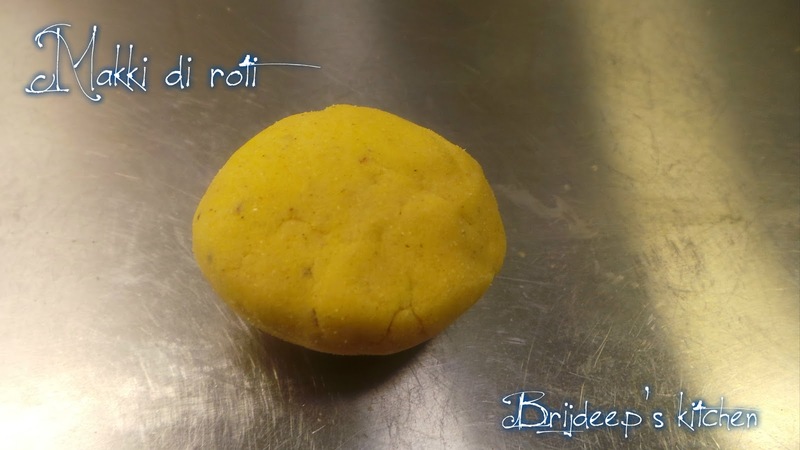 Pinch a small ball of the flour and make it as round as possible by rolling between your palms. Lay it on the flat surface and press the ball lightly with your fingers. Don't apply a lot of pressure of it will disintegrate. Flatten it a little more with your fingers and then try to lift it up carefully with a flat spatula. 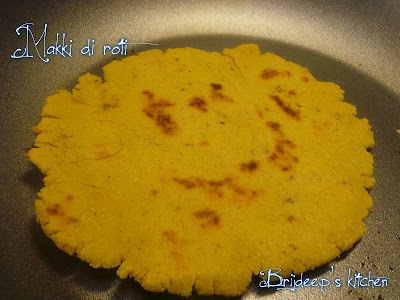 Sprinkle some dry makki flour at the bottom if required. Now lightly begin to roll it with the help of a rolling pin. Apply very light pressure, keep checking if you can lift it with the spatula. 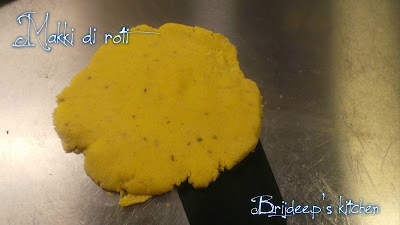 The roti might have little rough edges on the side, it's normal. 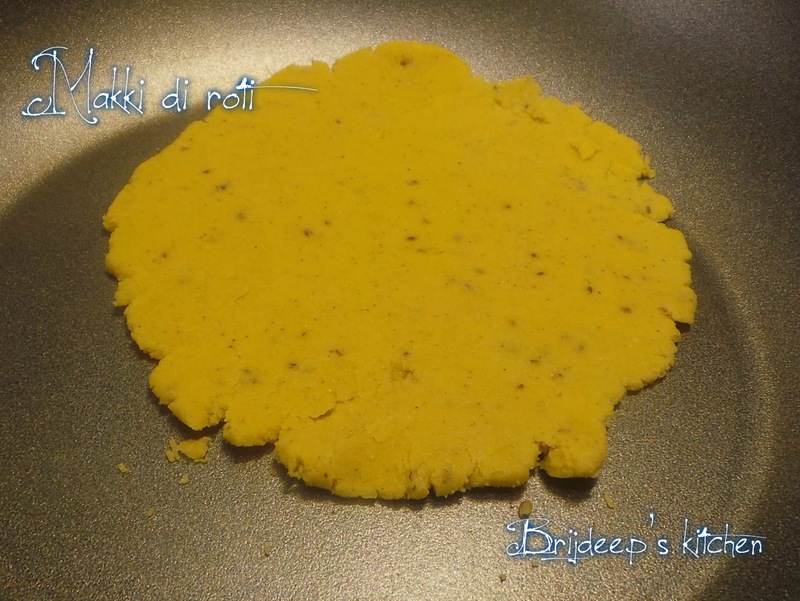 Take care not to make too big roti otherwise you won't be able to lift it up with the spatula. 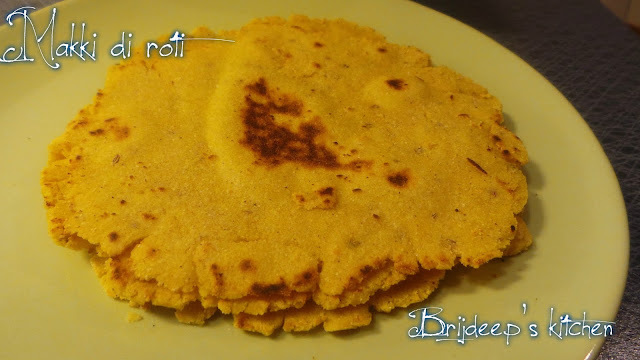 When it's done, lift up the roti with spatula and put it on the tawa on medium-high flame. Flip the side and press with a kitchen cloth. 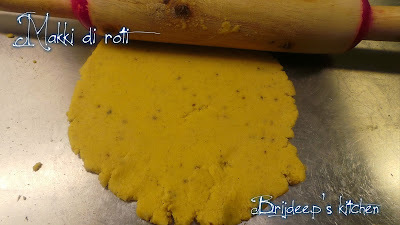 Flip again and keep cooking till the roti is done: light brown spots will appear on the roti. Prepare rotis from all of the dough in this way. 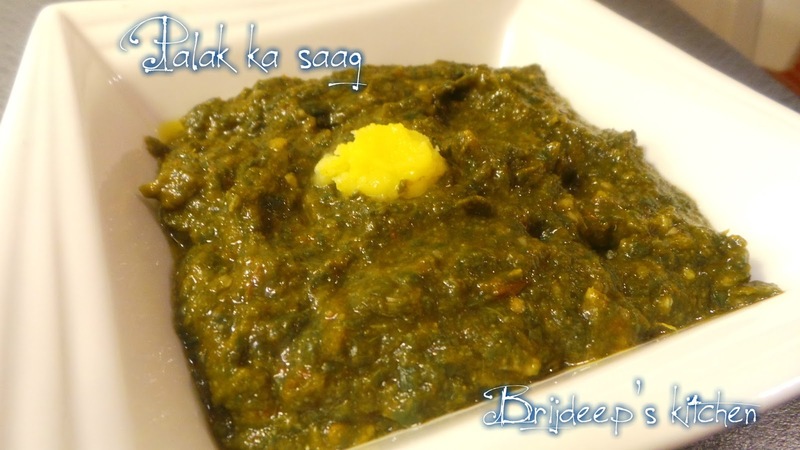 Serve hot hot with Sarson ka saag or Palak ka saag. 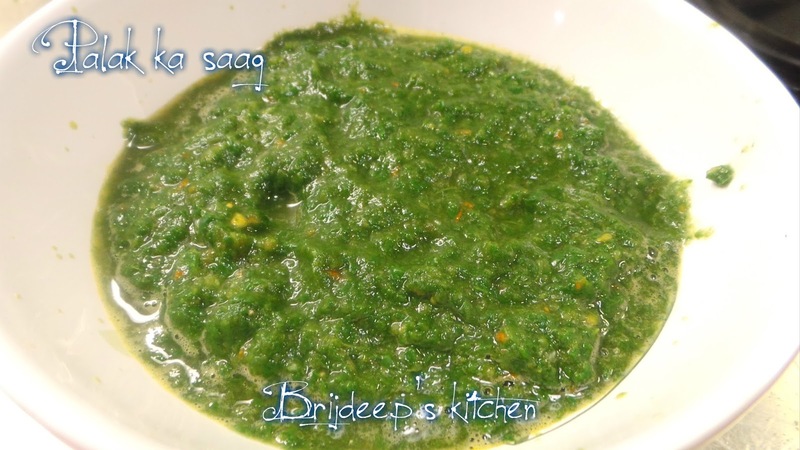 (This quantity of saag will serve 4 to 6 people; you can adjust the ingredients according to requirement). 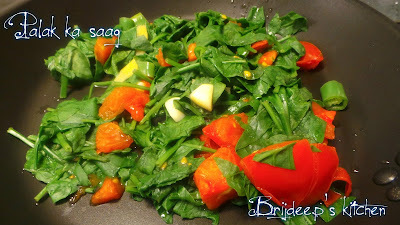 Wash and chop finely the mustard greens and spinach leaves. Pressure cook for 3 whistles with two cups of water. While the greens are getting pressure cooked, add the salt, red chili powder, garam masala, ginger and cream to the makki flour. Mix well. Heat 1 tbp. ghee and fry the flour mixture on medium flame until it starts getting golden brown. Turn off the flame and keep aside. 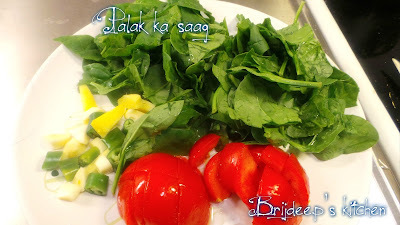 By this time, the mustard and spinach would be boiled. Let cool and grind to a smooth paste in the grinder. Keep aside. Heat the remaining 2 tbsp. 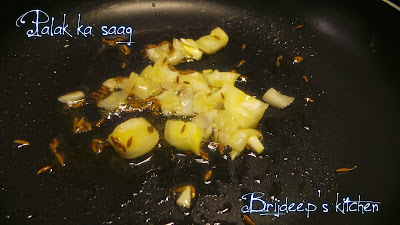 ghee and crackle the cumin seeds. Add the dried red chillis and onion. Fry until it starts getting brown. Add the garlic and green chilli and mix well. Let cook for a minute. Add the cooked flour mixture; mix well and let everything cook for 2-3 minutes. Now add the ground mustard and spinach paste. Mix well and turn the heat to medium-high. Let cook for 3-4 minutes. Do not cover. Turn the flame to medium-low and let cook for another 10 minutes. Turn off the flame, add a dollop of ghee and serve hot with Makki ki roti (procedure explained above), gud, papad and achaar. Enjoy !!! Loved this post? Do leave a comment/feedback in the comments section and don't forget to join my Facebook Page for regular latest updated from my kitchen ! !